MARK BRIGGS ATTORNEY EXPLAINS WHAT YOU NEED TO KNOW ABOUT THE DIFFERENCE BETWEEN A COPYRIGHT AND A TRADEMARK. 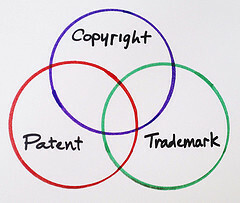 This week, I would like to continue along with our recent theme of legal intellectual property protection by examining the difference between copyrights and trademarks. First off, let me acknowledge that there are some similarities between copyrights and trademarks: they both protect intellectual property, and the federal government regulates them both. However, that’s pretty much where the parallels end. Ultimately, trademarks and copyrights protect two very different things, but you may very well wind up needing to use one or both during your time as a business owner. Trademarks, and I have detailed in some recent blog posts, are “generally a word, phrase, symbol, or design, or a combination thereof, that identifies and distinguishes the source of the goods of one party from those of others,” as defined by the United States Patent and Trademark Office (the government body that regulates trademarks.) So chances are, if you have a small business, you have one or more marks you would like to protect, such as your business/brand name, slogan, or a logo. A copyright, on the other hand, “protects works of authorship, such as writings, music, and works of art that have been tangibly expressed.” A copyright allows its owner(s) to regulate how the associated work is reproduced and/or redistributed. Copyrights are overseen by the U.S. Copyright Office, which is a division of the Library of Congress. The place where things get a bit trickier for business owners is when it comes to certain logos—particularly, those that involve a certain amount of “artistry.” This is not the easiest thing in the world to define—most logos qualify merely for trademark protection—and unless your logo is going to be something like a painting of you and your business partners, it’s most likely not going to be something you would have to worry about. But if you are at all concerned that there might be overlap, consult your attorney for clarification. Have you ever had to register for a trademark or a copyright in the course of running a business? Do you have any advice on the process for fellow entrepreneurs? Feel free to share in the comment section.